Here at the Fifth Avenue Art Gallery we know the importance of community. We strive to make a difference here…where we live and beyond! In March we hosted WHAT A DIFFERENCE A DAY MAKES: 24 Hour Art Challenge. The 24 participating artists had a 24-hour period in which to create an artwork based around a small set of prompts and guidelines to be revealed the morning of their workday. These works were sold in a very unique way to raise money for Very Special Arts Brevard. Established in 1987, this local organization is committed to providing persons with disabilities the opportunity to reach their full potential through the arts. 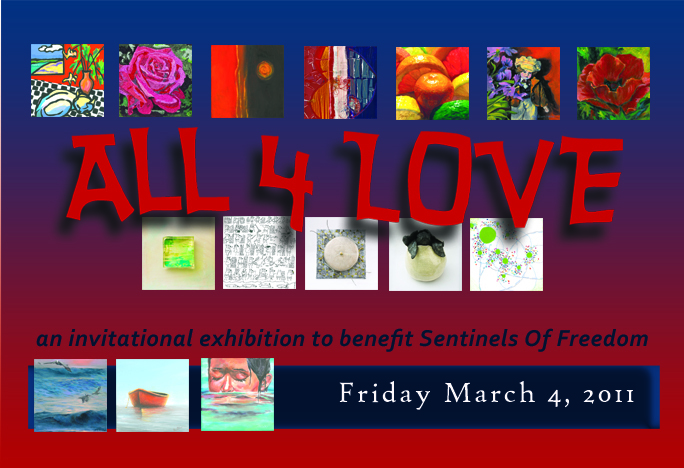 All 4 Love was an invitation exhibition to benefit Sentinels Of Freedom Space Coast. The exhibition included the artwork of 80 artists. All the 2-d artwork was done on 10″x10 canvases. We also had 14 3-d artworks in the exhibition. We sold 80 tickets at $110@ and held a “guaranteed raffle”. Each patron was invited to a wonderful reception with wine and hors d’oeuvres. They got to meet the artists and choose which piece of the exhibition to add to your collection by order of a randomly drawn number. It was great FUN! Including book sales we raised over $8000 for Sentinels Of Freedom. 36 artists were asked to produce an artwork and a book with Hopes and Dreams as their inspiration. 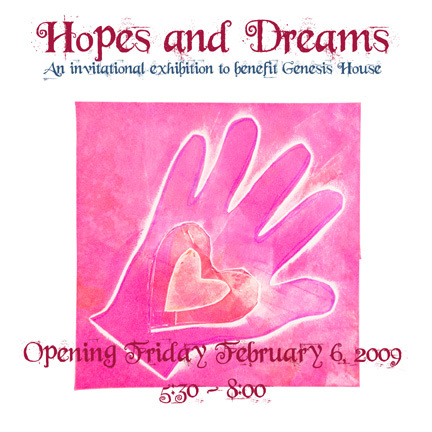 A portion of sales from the shows original artwork and 100% of the sales of the artists handmade books went to the support of Genesis House. More than 11,000 women and children have been housed over the years by Genesis House, Inc. here in Melbourne. Many women come from abusive relationships or have become homeless due to unemployment. Genesis House is committed to providing a safe, supportive, caring environment. Education, self-discipline, self-reliance, and independence from the welfare system are earnestly promoted. Counseling, personal improvement classes and appropriate health care are obtained for all residents. Classes in childbirth and parenting are provided as needed. We also had a baby/house shower for Genesis House, collecting items for the residents to use. An Invitational Exhibition with artworks by 36 artists. A portion of the sales went to buy a “Farmyard of Animals” for needy families in impoverished parts of the world, through World Vision. 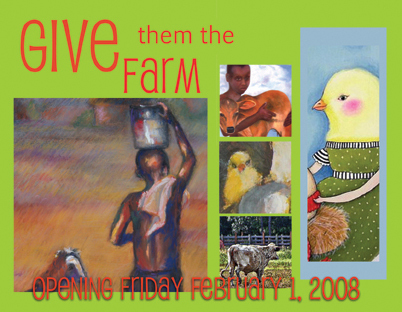 We raised $2500 through the generosity of the artists involved, and our patrons and bought a farmyard of animals.